You may experience Wi-Fi connection errors when booting your original Google Home speaker. Or, the smart speaker does not show as connected in the Google Home app. Both problems occur when the speaker is no longer linked to your Wi-Fi network. These situations can occur if you’ve changed your WiFi network name (SSID) or network password, but have not yet updated your Google Home device accordingly. This post details how to change WiFi on Google Home to account for new router additions or replacements For this demo, we use the 2018 versions of the Google Home app. They made easier the process somewhat in later versions of this app. With your iOS or Android based tablet and the Google Home app, connecting your smart speaker to a different Wi-Fi network is especially simple, and is done as follows. We assume here that the Google Home app has previously been linked to your Google account, that you’ve installed this app on a mobile device, and that your mobile device as well as the speaker are in range of the new Wi-Fi network; the one you wish to connect your speaker to. The screenshots below were taken from an Apple iPad Air. However, a similar Google Home app for Android is also available from the Google Play store. If not already operating, plug your speaker into a power source, as you’ll need to access the network parameters stored in its memory, as described below. You won’t be able to change these settings without AC power. 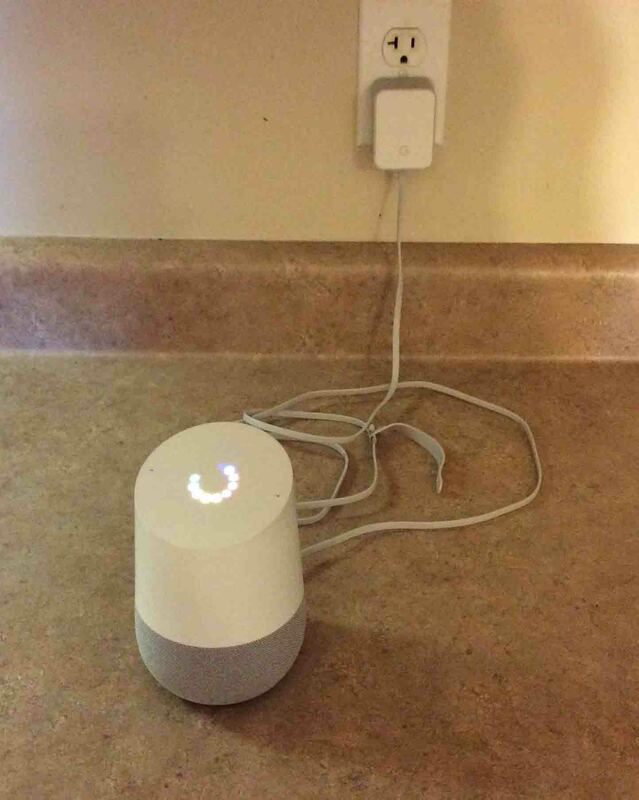 The next picture shows the Google Home speaker connected to AC power via the included AC adapter. Google Home Speaker powering up, showing multi-colored ring of lights on top, spinning and blinking during boot. Wait until your speaker finishes booting before proceeding to the next step. Avoid being further than fifteen to twenty feet away, for maximum setup speed and minimum errors. Run this app on your tablet computer. This app gives you access to your current Google devices and settings, and allows you to change them as needed. The app is located somewhere on the home screen pages, depending on where you might have moved it. On our iPad Air, it’s on home page three, as shown next, as pointed at by the purple arrow. Google Home App entry, as shown on the iOS home screen. How to change WiFi on Google Home, 2018 edition. We got the following screen at Google Home App startup. Google Home app on iOS, displaying the startup banner screen. Google Home app on iOS, displaying its home screen, with the hamburger menu control highlighted. Google Home app on iOS, displaying its hamburger menu, with the Devices Item highlighted. How to change WiFi on Google Home, 2018 edition. In the main (hamburger) menu, find the Devices item, as pointed at by the purple arrow in the previous screenshot. You may have to swipe up in the menu area in order to scroll the Devices item into view. Depending on whether or not your speaker is connected currently to a Wi-Fi network, different screens will appear at this point. If your speaker is currently connected and functioning correctly to an access point in your home network, you’ll then see a screen similar to the screenshot in step 6. Go there for further instructions in this case. If your speaker is powered up but not connected to any Wi-Fi network, then you’ll see a screen like the one pictured at the top of step 7. Go there for specific instructions that address this case. Google Home App on iOS, displaying the Devices screen, with its hamburger menu link highlighted. This shows that your speaker is online and can accept voice commands and questions. This would be the case if you have multiple Wi-Fi networks in your home, and you wish to disconnect your speaker from one of them that is working, and connect it to another of them. Maybe you moved the speaker from the first to the second floor, and would like to connect it to the second floor access point if you have one, because its Wi-Fi signal is stronger and more reliable up there. In short, you’re moving your speaker from one working Wi-Fi network to another. Find the hamburger control item pointed to by the purple arrow in the last picture. You then see a pop-up menu appear in place of the hamburger button, as shown in the next picture. Google Home app on iOS, displaying its Devices screen, showing an original Google Home speaker control menu, with the Settings option circled. The Settings item is circled in the last picture. The original Google Home speaker’s Settings screen then appears, as shown next. Then, scroll down that screen until you locate the Wi-Fi setting, as circled in the next picture. Google Home app on iOS, displaying its -Device Settings- screen for the original Google Home smart speaker, with the -Wi-Fi Settings- option circled. How to change WiFi on Google Home, 2018 edition. The WiFi item is shown in the above picture. This setting shows the Wi-Fi network to which the speaker is currently connected, as circled in the previous screenshot. Google Home app on iOS, displaying its -Wi-Fi Settings- screen, with the -Forget This Network- link highlighted. In this scenario, we wish to disconnect from the 937T681J4059H_2G_Guest network, and connect to the 937T681J4059H_5G network. Both are in range and available to our Google Home speaker. As shown in the last step, our speaker is currently connected to the 937T681J4059H_2G_Guest network. We want to forget that network, as mentioned. So we do so by tapping the red bar. The -Forget This Network Confirmation- screen then appears, as shown next. Google Home app on iOS, displaying its -Forget This Network- prompt, with the -Forget Wi-Fi Network- button highlighted.6e. The Forget Wi-Fi Network option is pointed at by the purple arrow in the previous picture. The Google Home app then briefly displays the Forgetting Wi-Fi Network screen, as shown next. Google Home app on iOS, displaying its -Forgetting Wi-Fi Network- screen. Executing this step disconnects your speaker from its current Wi-Fi network while the above screen is displayed, as well as forces your speaker to forget the settings it retains in its memory for that network (SSID, security type, and password et al). After a short pause, you are returned to the Home screen in the Google Home app, as shown next. Google Home app on iOS, displaying its home screen, with the hamburger menu control highlighted. How to change WiFi on Google Home, 2018 edition. Again, find the hamburger control on the Google Home App Home screen. The main menu then displays as shown in the next picture. Google Home app on iOS in 2017, displaying its hamburger menu, with the Devices Item highlighted. In the main (hamburger) menu, find the Devices item, as pointed at by the purple arrow in the previous screenshot. You’ll now get the same screenshot as covered next. Now, continue with step 7. If your speaker is offline (i.e. not able to connect to any in-range Wi-Fi networks), or if you previously disconnected it from Wi-Fi as described in step 6, then you’ll see something like the next screen. Google Home app on iOS, displaying its -Devices- screen, with the -Add New Device- button highlighted. If your speaker does not appear in the Devices list, then proceed with step 7a. If it does, and is showing that it requires set up, then skip ahead to step 8. 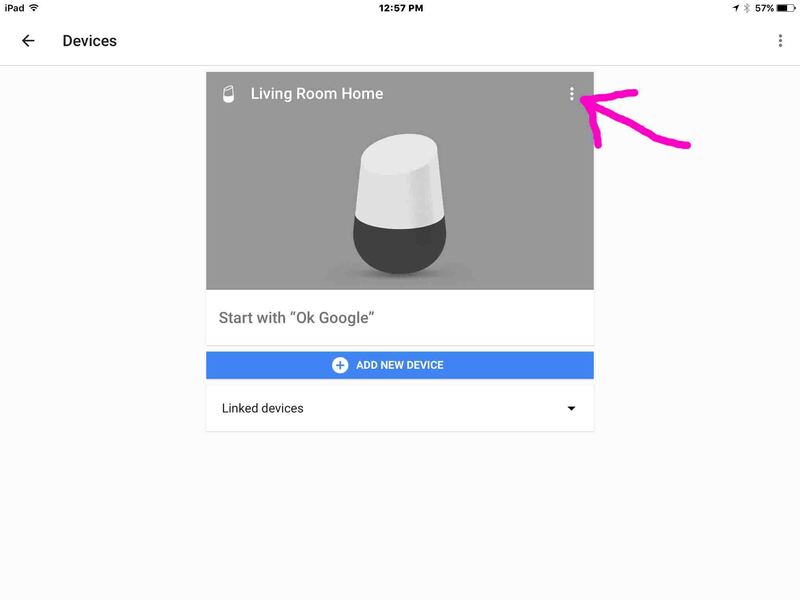 If you and your mobile device that you’re running the Google Home app on are close to the speaker, and it still does not appear in the Devices list, then you may have Bluetooth on your mobile device turned off. If that’s the case, then the Google Home app asks you to turn Bluetooth on, as shown next. Google Home app on iOS, displaying its -Turn On Bluetooth- prompt, with the -Bluetooth Settings- button circled. How to change WiFi on Google Home, 2018 edition. This takes you to the Settings app on your mobile device, specifically, to the Bluetooth settings page. We got the following page on our iPad Air when we did this. iOS -Bluetooth Settings- screen, with Bluetooth turned off, and the -Turn Bluetooth On- control highlighted. In our case, we toggled on the switch pointed at by the purple arrow in the previous picture. Then, our Bluetooth Settings screen filled in as shown next. iOS 11 -Bluetooth Settings- screen, with Bluetooth enabled, and the -Turn Bluetooth Off- toggle control highlighted. As circled in the previous picture, our Bluetooth is now turned on. The app then displays the Devices screen again. But this time, your original Google Home smart speaker should now appear in that list, with a needing setup status, as shown next. Google Home app on iOS, displaying its -Devices- screen, showing an original Google Home speaker needing setup, with the -Set Up- button circled. How to change WiFi on Google Home, 2018 edition. The app then attempts to find and connect to the original Google Home speaker, and displays the following screen and message while doing so. Google Home app on iOS, displaying its -Connecting To Google Home Speaker- screen. Reminder: Be sure your tablet is within several feet of the speaker. Otherwise, setup may fail. If all goes well, the Google Home app will search for your speaker and find it. When it does, it plays a chord sound on the speaker and displays the following screen. Google Home app on iOS, displaying its -Did You Hear the Sound- prompt, with the -Yes- link highlighted. Tap the Yes link if your speaker did play the chord noise. The app then displays the Where is this device? screen, as shown next. 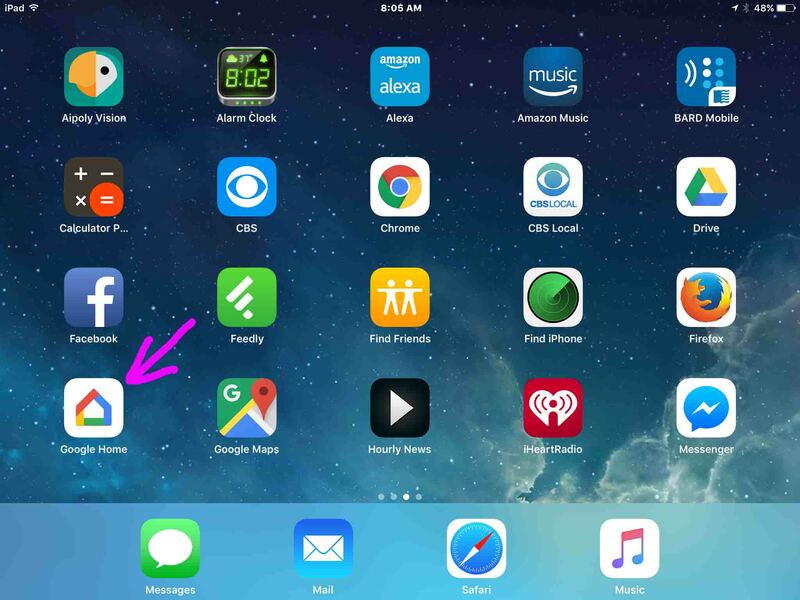 Google Home app on iOS, displaying its -Where Is This Device- screen, with the -Living Room- choice circled. Google provides a list of suggested names on the list as seen on the last screen. We picked Living Room for ours. The screen then changes to the following, showing our room choice (Living Room) checked, as shown next. Google Home app on iOS, displaying its -Where Is This Device- screen, showing the -Living Room- choice checked and the -Next- link circled. The Choose Your Wi-Fi Network prompt then appears as follows. Google Home app on iOS, displaying its -Choose Your Wi-Fi Network- screen, with our choice highlighted. How to change WiFi on Google Home, 2018 edition. on this screen. For ours, we’re selecting the 937T681J4059H_5G network. So we tap that, and it becomes checked, as shown in the next screenshot. Google Home app on iOS, displaying its -Choose Your Wi-Fi Network- screen, showing our choice as turned blue after tapping it. If you’ve never logged into this network before with its current password, the system will prompt you to enter a password for it, as shown next. Google Home app on iOS, displaying its -Enter Wi-Fi Password- screen, with the -Use this Wi-Fi network to set up future devices- check box circled. If you wish this same wireless network to be used if you add any other Google Home devices at this location in the future, then leave the Use this Wi-Fi network to set up future devices checkbox checked. If not, then uncheck this. Tap the Enter your Wi-Fi password field, observe the virtual keyboard appear, and then type in the password. Your screen should look similarly to the next screen shot. Google Home app on iOS, displaying its -Enter Wi-Fi Password- screen, showing virtual keyboard and the password field filled in. After you’ve punched in the correct password, collapse the virtual keyboard. You should then get the following screen. Google Home app on iOS, displaying its -Enter Wi-Fi Password- screen, showing the -Password- box filled In, and the -Connect- link highlighted. Do this step once you’ve typed in the password. Your speaker then attempts to connect to the Wi-Fi network of choice. Google Home app on iOS, displaying its -Connecting To Wi-Fi- screen. If it encounters no trouble, the Wi-Fi Connection Successful screen appears briefly, as shown next. Google Home app on iOS, displaying its -Connected To Wi-Fi- screen. How to change WiFi on Google Home, 2018 edition. After several seconds, the app returns you to its home screen, as shown next. 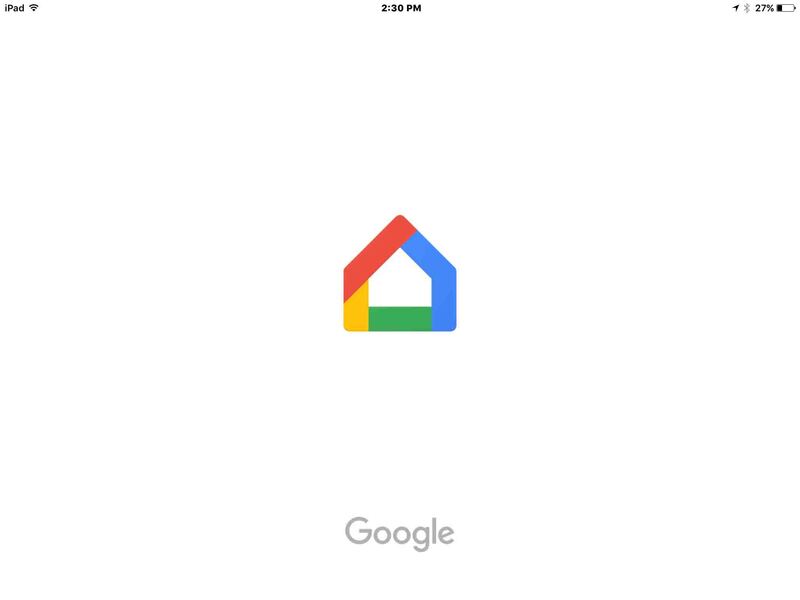 Google Home app on iOS, displaying its Home screen. Your speaker is now connected to a different Wi-Fi network. Ask it the time, and you’ll know the connection is good if the speaker responds with the correct answer. Pairing Original Google Home Smart Speaker as s Bluetooth Speaker, NOT YET! 2019-04-10: Added key phrase targeting and more tags. Removed ad code.